Musique & Vin au Clos Vougeot has an exceptional vocation; that of creating a fusion between musicians of international fame and the winegrowers of Burgundy. It offers an amplified experience to its public, pleasure that appeals to both the ears and the palate. Thanks to the sponsorship of generous patrons and partners, this unique, ten-day festival receives some of the biggest names of the musical world. Headliners include Jean-Yves Thibaudet, the Quatuor Talich and Gautier Capuçon, who regularly and enthusiastically appear along with Renaud Capuçon, Menahem Pressler, Yo-Yo Ma, Myung-Whun Chung, Ernst Ottensamer, Marlis Petersen, Emmanuel Pahud, Sunwook Kim, Joseph Calleja, Bruno Delepelaire, Matthew Polenzani, the Die Wiener Quintet, Ildar Abdrazakov, Magali Mosnier and Nicolas Dautricourt. 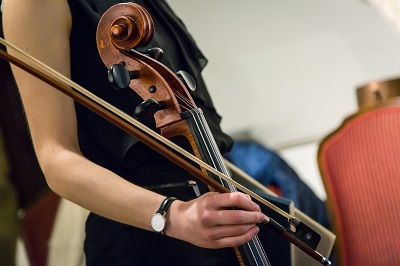 Promising young artists are placed alongside the key names during the festival, they are helped by various initiatives such as Le Fonds Instrumental (instruments and funds for young musicians) and the “Young Talents” scholarship. 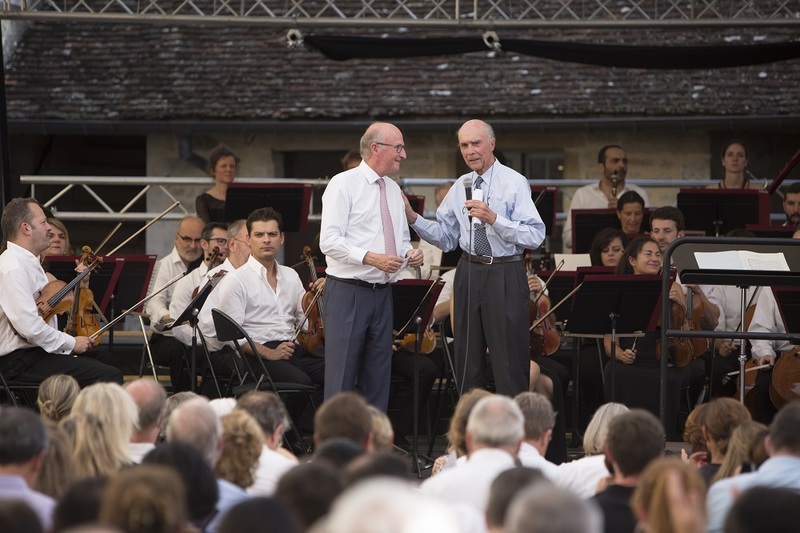 This festival creates intimate bonds between musical excellence and the great wines of Burgundy, thus each concert is preceded by a wine tasting made possible by the many partners. 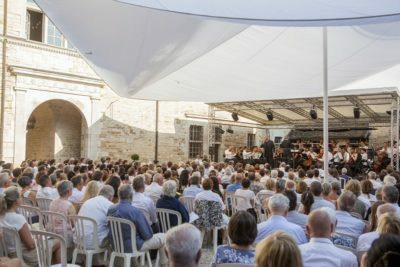 All concerts and tastings are hosted in places that are symbolically and historically linked to the wine of Burgundy, and so the prestigious settings of the Château du Clos Vougeot, the Château de Meursault and the Grande Halle de Beaune (town center) are fervent, long-time partners. The Festival being eager to expand the musical offer is currently settling into new locations. In 2019 Musique & Vin au Clos Vougeot will take place from Saturday 22 June to Sunday 29 June. With : Daniele Gatti with the Orchestre des Climats de Bourgogne for the gala concert on June 30, the soloists of the Vienna Philharmonic Orchestra in the magnificent church in Meursault, Michel Dalberto, Svetlin Roussev and Pierre Génisson with the Quartet 212, Jean-Yves Thibaudet, Gautier Capuçon and Lisa Batiashvili gathered on June 23 at Château du Clos Vougeot, the Dijon Bourgogne Orchestra conducted by David Chan, to accompany the 2019 Young Talents, Gabriella Reyes and Caroline Sypniewski on June 22 in the Halle de Beaune... The complete program of the festival will be arriving soon ! 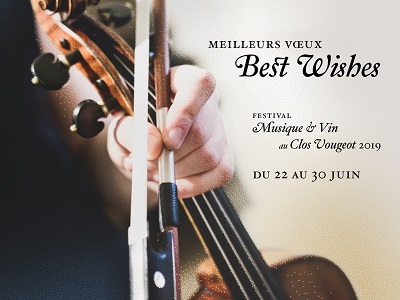 All the team of Musique & Vin au Clos Vougeot wish you a very good year 2019 and offer a rendez-vous from the 22nd to 30th June for the 12th edition of the festival. The next auditions for the Fonds Instrumental will take place on April 2nd, 2019 at the Couvent des Cordeliers in Beaune. You can find complete information and download the application form on the Young Talents page. Relive the highlights of the 2018 edition with some pictures on the media page.